Was her suggestion a betrayal of all that she and the women of her generation had fought for? Or was it brave, honest, and radical? He agreed to her terms, and they found a kind of happiness that more traditional forms of commitment had never provided. They talked endlessly about why this was, and then began to tape their conversations: at home and in restaurants, on the telephone and in bed. This book is based on those tapes, produced thirty years later, when they decided to open up the innermost workings of their relationship to scrutiny. 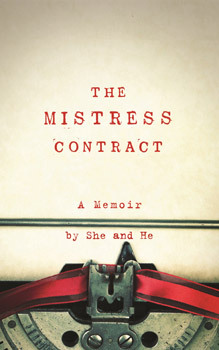 Provocative, unapologetic and inspiring, The Mistress Contract shines an unflinching and utterly compelling light on relations between the sexes. She and He are the pseudonyms of a couple who first met at university and then lost touch. When they met again twenty years later, they began an affair which led to the Mistress Contract, which has been in force for over 30 years. They live in separate houses in the same city on the west coast of America. She is 88. He is 93.